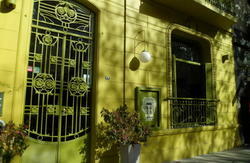 It is located in the beautiful town of Tigre in the MV MartÃ­nes Street 13, corner Paseo Victoria. Four rooms equipped with air conditioning / heating, ceiling fan, Wi-Fi and with windows and balconies with a superb view of the LujÃ¡n River. The rooms are; Double, Triple and Quadruple. It has, shared or private bathrooms. The kitchen is shared and is equipped to allow each guest to use and cook comfortable and at ease. Except the breakfast buffet will be served from 8 to 11 am.